Thanks for passing this article along. It’s interesting to know what the voter turnout percentages are for municipal elections the North Shore. It’s also good to see that you care about the health and accountability of our political institutions. I do as well, having grown up in the City of North Van and now living in the District. I appreciate hearing your thoughts on compulsory voting and proportional representation, and it’s good there is more talk about this sort of change lately. But I remain skeptical about their power to improve our political system. Though they could bring some improvements, these changes do not, in my opinion, go to the core of the issue–that some people rule others, without the consent of the ruled. This wouldn’t be such a big deal if governments stuck to basic functions like the founders of western democracies intended. If our rulers focussed on providing justice, policing, national defence and some public transportation infrastructure and environmental protection, and otherwise let us govern our own lives, I could wouldn’t make a big fuss about the absence of consent of the governed. However, today’s governments do not content themselves with providing basic public services; they want to set the direction society moves in, draw up elaborate plans, and extract the necessary funds from the populace to implement their vision. Democracy is supposed to guide that vision, but the idea that any one vision is suitable for all citizens is a dangerous fallacy, and it is unjust to force those who have alternative visions to submit to that of the majority. 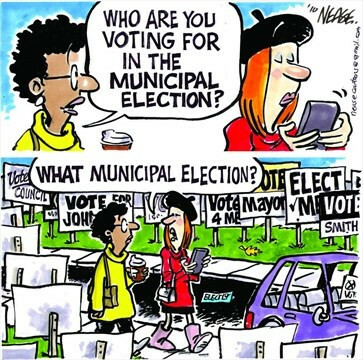 To make it worse, our elected politicians do not even have a mandate from the majority of the voters, as your example of the tiny margin of citizens who actually voted for seated councillors shows. Government should stick to providing services that benefit all citizens; otherwise politics becomes a battlefield of special interests vying for the power of the state to implement their vision of society over competing visions. To me, the only way to get out of the mess we’re in is to reduce the size and scope of government. It would also help to push powers down from the federal to the provincial government, and from the provincial to the municipal, and perhaps even down further, to neighbourhood citizen assemblies. The reason for this is that we have a much better chance at the local level of holding politicians and bureaucrats accountable. Furthermore, if most of decision-making power is held at the local level, citizens stand a better chance of finding another jurisdiction that governs in a way they prefer, and moving there. This ability of citizens to “vote with their feet” can be another mechanism to hold government accountable. Given all of this, I do not find it surprising that voter turnout is so low. People are deeply cynical about our political system, and correctly see that at the federal and provincial levels, the major political parties are not very different from one another on matters of substance, and in any case can’t be trusted to keep their campaign promises. At the municipal level, I think most voters understand that no matter who they elect, property taxes will go up, density and traffic will increase, and the bureaucracy to support these will grow. What I believe many of these non-voters are waiting to hear is a vision of society that puts them in the driver’s seat. Such a vision would mean the removal of laws that impinge on their authority to make decisions over their own lives and property. It would also lay out some mechanism that gives them a meaningful voice in those decisions that require the agreement of the community (e.g. what kind of public infrastructure to build). I believe that such a vision of a free society that relies on limited government, personal responsibility, and civic engagement at the local level will inspire more and more people to vote for alternatives to the status quo and build and strengthen a plurality of voluntary institutions that allow citizens to work directly with one another to achieve their visions of society.